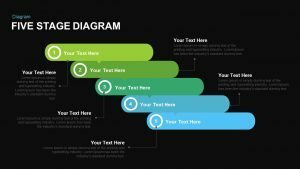 10 sequence of events flowchart PowerPoint template is a process flow diagram that can be used to show the timeline development or step by step process of growth and development. 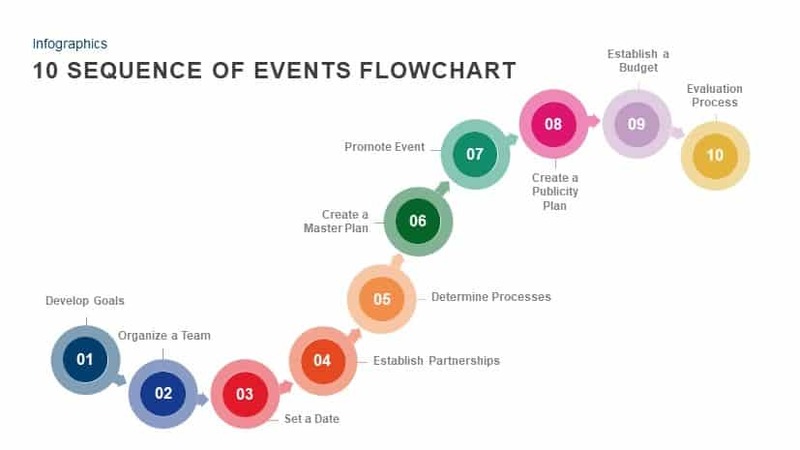 The 10 sequence of events flowchart PowerPoint diagram is used to show ten steps of an event or ten stages of an event. 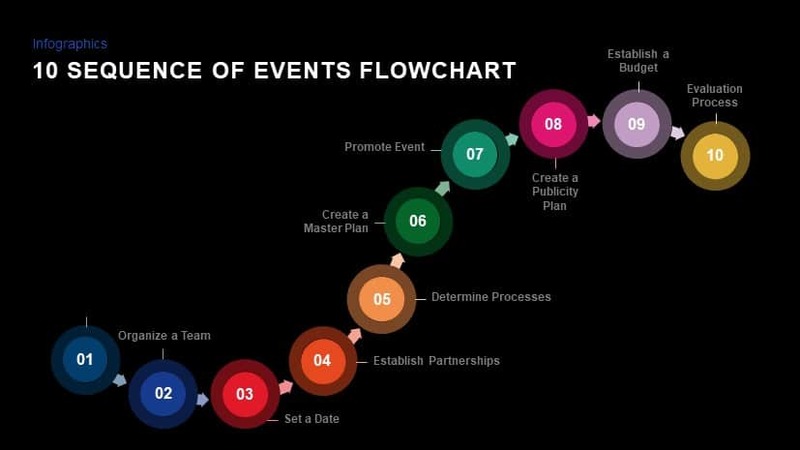 Normally, an event flowchart is a type of chart used to document a flow of events. 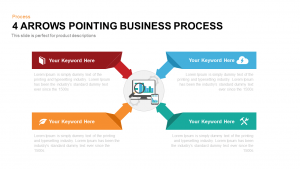 It is a visual picture of business steps for probable developments. 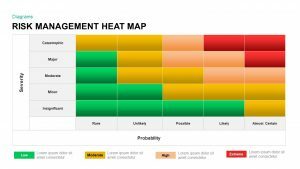 It typically consists of a design of events enclosed in a table or a specified shape. It can graphically explain a process using shot texts and symbols. 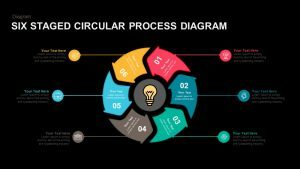 This sequence slide for PowerPoint presentation is containing useful flow chart elements that you can use to make your presentation in a spontaneous and uncluttered manner. Ten sequence flowchart is a diagram that represents a process or workflow or an algorithm. It shows differently colored circles connected together with arrow shapes. Each arrow are pointing towards the next step and having a sequential relationship with the subsequent and preceding stages. 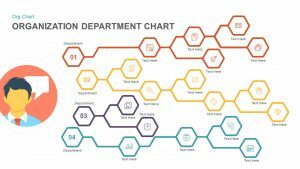 Flowcharts are widely used for many different industries to design, analyze report or even manage an entire business process. 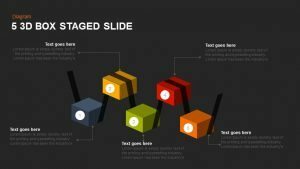 Use the sequence of events slide to describe process flows and their milestones. 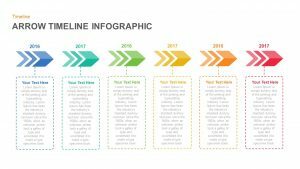 The PowerPoint template comprises a timeline model that can briefly explain the flow of a particular business project. 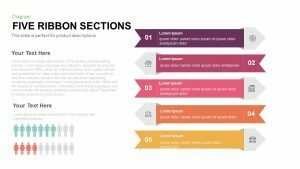 PowerPoint template shows the sequential relationships of the elements are common in PowerPoint presentation. 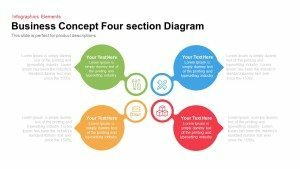 The 10 sequence of events flowchart template can be used to show the logical connections of the presentation topic, the arrangement is ideal to show the logical connection between the variables. 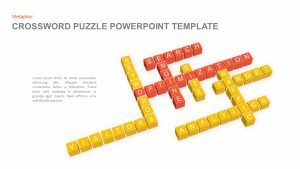 The https://slidebazaar.com/categories/powerpoint-templates/ is appropriate for the roadmap visualization. The presenters can singled out the each topic and deliver their stimulating explanations verbally. 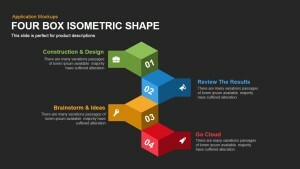 The numbered area can alter by meaningful infographic icons. The presenters can select each icon as per their presentation topic and amalgamate with the entire theme. 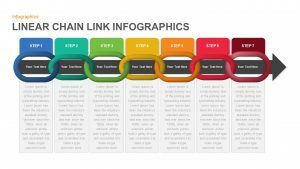 The users can go through our gallery and find out more stunning flowcharts and timeline roadmap PowerPoint templates.